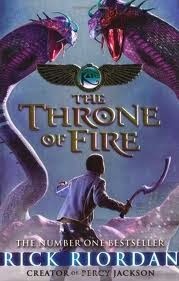 Rick Riordan is possibly the next big thing in children’s fiction after J K Rowling. He and Suzanne Collins of Hunger Games fame also have some kind of a cult following that is at least a faint shadow of what J K Rowling achieved. Riordan’s more famous work is the Percy Jackson series, the first book of which is already released as a movie. Though Percy Jackson was a fun read and enjoyed it immensely, I liked his Kane chronicles more. It is a much shorter series having just three books - “The Red Pyramid”, “The Throne of Fire” and the “The Serpent’s Shadow”. In terms of reading experience I would actually go as far as to rate it at par with Harry Potter. Rick Riordan is a history teacher who weaves his stories around ancient mythologies. While Percy Jackson is based on Greek and Roman mythologies, Kane chronicles is based on Egyptian mythology. While Percy Jackson series felt a bit childish or like a spoof in some places, I felt Kane chronicles had greater depth. I could also see some philosophical undertones that reminded me of Neil Gaiman’s 'American Gods'. In some ways, both the books make you look within and reexamine the deeper meaning underlying Gods, rituals and religious beliefs. While American Gods is darker adult fiction that does this directly, Kane chronicles being a lighter children’s read, does it in a more subtle way. Rick Riordan is possibly not the first person to use mythology in his stories – most of children and adult fantasy draws from mythology in some way or the other. But what I liked about it is how he seamlessly blends the mythological plot line with contemporary times and weaves an interesting tale that is not really too predictable. I find some other authors have done a hotchpotch job in using mythology, while I sense a greater perfection in Rick Riordan’s works. Things don’t grate or feel out of place. The other aspect that works very well is the humor. While the humor felt a bit forced in Percy Jackson, I found it flowing much more naturally in Kane chronicles. The author has also chosen an interesting narrative technique. The story is narrated as alternating first person audio recordings of the events by siblings Sadie and Carter Kane. Personally I have learnt most of my mythology from Rick Riordan’s books. I was somewhat aware of Greek mythology but hardly knew anything of Egyptian mythology. This book served as a primer on Egyptian mythology for me and has inspired me to read more on Egyptian mythology. Rather than obscure references or adaptations, Riordan directly uses mythological elements as they are. So they help in learning the actual mythology without the veil of author’s creative adaptation. Also they are much lighter fare than serious academic works or direct translations of mythology. Overall I would recommend this series to everyone – definitely for fantasy buffs and children. Others may also enjoy the light humorous tone of the narrative that can give few hours of delightful reading. No Suresh - Never came through even to spam folder. Don't have this, Suresh - read from library. Maybe Pooja or one of the younger ones have to lend you. Sid loves Rick Riordan's books. He has read many books by him. It is the benefit of having a membership from Just Books :). You should also try them, Rachna if you have enjoyed Harry Potter. They are fun read.